Stacey Abrams and Andrew Gillum — two of the Democratic Party’s breakout candidates of 2018, despite losing their elections for governor of Georgia and Florida — are looking to parlay their near-success into the defeat of Donald Trump in 2020. The pair of young, progressive African-American pols amassed so much political fame that they’re a must-call for the growing roster of likely Democratic presidential contenders. They’re also on some early and unofficial lists as possible vice-presidential running mates. The White House hopefuls don’t just crave an endorsement from Abrams or Gillum. Each boasts valuable donor and volunteer lists, in the Southeast’s two biggest states that, if won next year, would almost guarantee a Democratic White House. The attention Abrams and Gillum are receiving from presidential hopefuls is an indication of the growing pull of the party’s progressive base and highlights the role each could play as gatekeepers for African-American and liberal voters. In a crowded Democratic primary, that could make them kingmakers for a candidate lucky enough to score an endorsement or, at least, anchors who keep the candidates moored to a liberal agenda. For now, both tell POLITICO they intend to remain neutral and plan to continue building on their campaigns to benefit the party’s ultimate nominee. Abrams told POLITCO’s Women Rule Podcast that her group, Fair Fight Georgia, will push for electoral reforms. And Gillum said in an interview that he’s retooling his political committee, Forward Florida, to register more voters and engage with more voters as soon as possible. “In this period of time, whatever resources that I raise and time and energy I spend in this state is going to be around voter registration and deep-level engagement, so that when we have a nominee, we have an apparatus we can turn on,” Gillum said, noting he lost by such a slim margin that the general election for governor went to a recount for the first time in Florida. Gillum ticked off stats from his 2018 campaign that he argued could be a huge asset to the eventual nominee: 70,000 supporters who mobilized in various ways on his behalf; more than 1 million “good, live” cell phone numbers with supporters who had conversations with his campaign; and more than 1 million email addresses. Those are “hard assets that we built over the course of my race that I have no intention of allowing to go dormant when we have a presidential election in 2020,” Gillum told POLITICO. Through her Fair Fight Georgia committee, Abrams said she’s focused on making sure that voting machines are updated in her state, voter suppression is ended and that Democrats who turned out in huge numbers in 2018 stay engaged in 2020. Abrams’ crusade to end voter suppression and Gillum’s advocacy for a new constitutional amendment that to allow most former felons the automatic right to vote cemented their reputations as crusaders for election reform. That, plus their status as young, minority leaders, has made them sought-after figures in the ramp-up to 2020. As a result, candidates and would-be candidates have been calling. Neither Abrams nor Gillum would say whom they spoke to or about what specifically. But Gillum acknowledged some of the presidential hopefuls have asked him to play unspecified roles in their campaigns. Nearly all of the Democratic contenders endorsed Gillum and Abrams in 2018. Sen. Bernie Sanders (I-Vt.) played an outsize role for Gillum in his come-from-behind win in a crowded Democratic primary. Former Housing and Urban Development Secretary Julián Castro, who announced his presidential bid Saturday, was one of the first big-name Democrats to endorse Gillum when many had written off his candidacy in the early days of the primary. Ties between Abrams, Gillum and likely contenders in the 2020 presidential field run deep. Sen. Cory Booker (D-N.J.) has known Abrams for years and has kept in touch with her since the election. He was also an early surrogate for Abrams’ campaign. Sen. Kamala Harris (D-Calif.), another early supporter of Abrams, has spoken with the Georgian multiple times since Election Day, according to a source familiar with the call. Sen. Elizabeth Warren (D-Mass.) spoke with Abrams in early November after the candidate suspended her gubernatorial campaign. Warren also left a voicemail with Gillum after trying to connect by phone, according to another source. With such rising stars and so much at stake in the primary and general election, phoning Abrams and Gillum is a must, said veteran Democratic strategist Doug Rubin. “Any legitimate 2020 candidate who’s not reaching out to Gillum and Abrams right now is probably not going to win. I mean that’s just a smart play right now,” said Rubin, a former chief of staff to Gov. Deval Patrick. Abrams and Gillum will have to consider their own political ambitions as they navigate the presidential primary. Assuming neither is chosen as a running mate in 2020, Gillum has more time than Abrams. Florida doesn’t have a statewide election for a seat he could run for until 2022, when Sen. Marco Rubio and Gov. Ron DeSantis face reelection. Democrats see Abrams as a potential top contender for Senate in 2020. And Abrams has said she’s mulling running for office again. She recently met separately with Senate Minority Leader Chuck Schumer (D-N.Y.) and Sen. Catherine Cortez-Masto (D-Nev.), chairwoman of the Democratic Senatorial Campaign Committee. 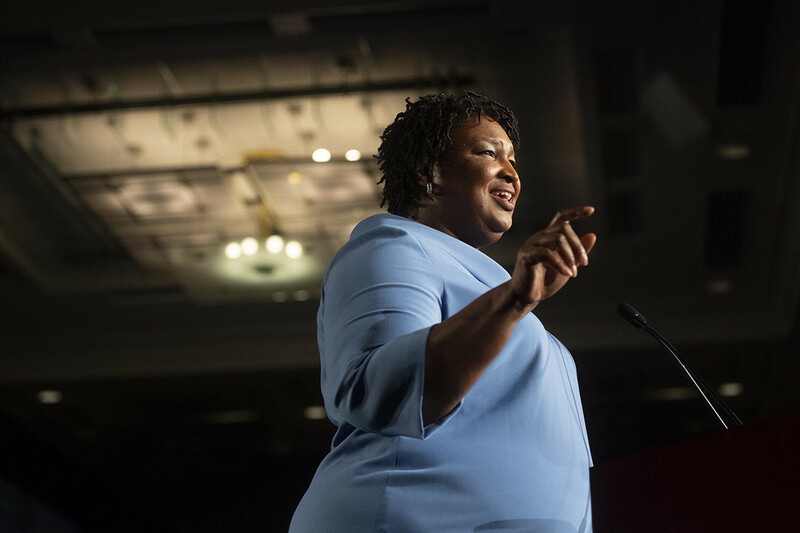 Abrams said her close election showed that Georgia is moving leftward. “We have demonstrated that Georgia is viable,” she said, pointing out it’s the eighth-biggest state in the nation. Gillum, too, said his election clapped back against the conventional wisdom that Florida is a drifting away from Democrats. He noted that he ran on the most progressive agenda the state ever saw for a Democratic nominee for governor, and he came closer to winning than any of the five other Democratic candidates for governor. “Without a doubt,” Gillum said, the Democratic nominee should be a “more progressive voice” who speaks out about criminal justice, health care, the economy, the environment and guns. But, he said, the nominee has to make a personal connection with voters. How to reach federal employees during a shutdown? Twitter.